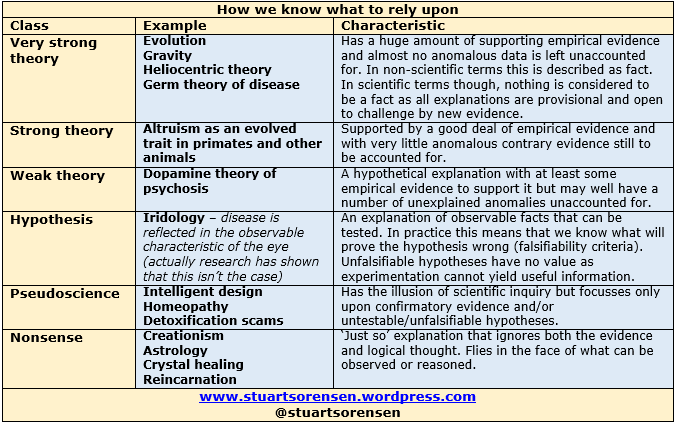 Lots of people seem to be very confused about the nature of evidence and the meanings of terms such as ‘theory’, ‘hypothesis’, ‘science’ and ‘nonsense’. So I’ve put together a little table that I hope will be helpful. It might clear up a few misunderstandings. For example the phrase ‘only a theory’ doesn’t mean it’s not reliable. In fact, in the case of very strong theories such as the theories of evolution or gravity it’s as close to fact as cautious, scientific convention will allow. Creationists beware – you have no idea how silly you appear when you use that particular phrase to try to knock down Darwinian evolution. I’ve made some amendments to the table below. This is because some people have challenged the ranking of the examples I used in the original. Since the point of this post is to outline the hierarchy itself I’m quite happy to use different illustrations. I may yet make further amendments in the light of scientific evidence for reincarnation which I have been promised and am hoping will actually materialise. Incidentally that’s the main advantage of scientific thinking methods over ‘Just so’ stories like creationism. Scientific thinking involves accepting when the evidence demonstrates that we have been wrong and changing our minds accordingly. That’s why scientific understanding moves on whereas creationism (for example) is essentially making the same, tired arguments that the Rev. William Paley first came up with 200 years ago. Anyway – I hope this table helps clear up some issues for the hard-of-understanding among us. If your browser only displays half the table just double click it to see the whole thing. Actually serotonin doesn’t necessarily have a strong link with depression. Some people have low levels of serotonin but don’t get depression. The link is quite complex… there does seem to be a link but it’s not a direct mapping. If depression was just about serotonin then SSRI’s would work for everyone… but they don’t. However it’s great that they do help a lot of people. Hence it’s only a strong theory (not very strong). Lots of correlation but significant anomalies and open to debate. Much more is needed. Still – it is only 2014. Give us another century and we might actually know something reliable and universally applicable about mental health. Right now we’re reduced to little more than speculation a lot of the time. Knowledge is facts, information, and right answers. Instructors are authorities who know the facts. Teaching is telling students those facts. Learning is recording information in notes, committing it to memory, and feeding it back as answers on the test. Uncertainty or disagreement among authorities. Multiple perspectives or more than one answer. As a trainer and practitioner I fee like I have a foot in both camps. From my perspective knowledge and the process of learning is one thing (I don’t agree with your definitions by the way) and the nature of reliability of evidence is another.